Hundreds of faithful flocked to St. Petersburg today to venerate the "miraculous" icon of the last Russian tsar, Nicholas II, who was executed by the Bolsheviks and was canonized by the Russian Orthodox Church in 2000. "I am Russian and Orthodox, and for me the holy martyr Nicholas II is a symbol of Russia," said Anatoly Krougklof, 65, while waiting in line that lead to the icon in an exhibition center in the former imperial capital. The icon of the last Tsar is a copy of the original located in the U.S., which in 1998 was deemed "miraculous" because it emits a fragrance of myrrh. 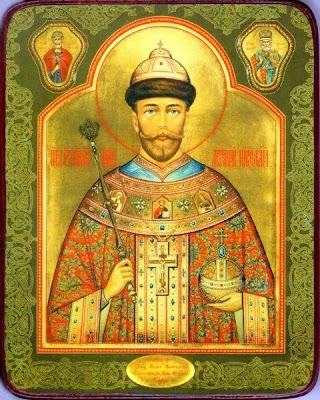 The then Patriarch of Russia, Alexis II, had placed the icon on a plane to fly above all Russia. "The resurgence of Russia will begin with the rebirth of faith. I am very pleased to see many people here, near the icon of the Tsar-martyr" said 57 year old Sergei Antotsenkof. Nicholas II, his wife Alexandra and their five children were executed by the Cheka, the political police of the Bolsheviks on July 17, 1918 in Yekaterinburg in the Urals. Their remains were buried in 1998 in St. Petersburg in the family tomb of the Romanovs.